Daggerfall's worldspace is, ostensibly, one of the largest in video game history; according to Bethesda, it rivals Great Britain in size. This claim, however, is unverified, and calculations by fans have turned up various answers. Nevertheless, the game boasts a vast number of regions, and an enormous amount of unique locations. 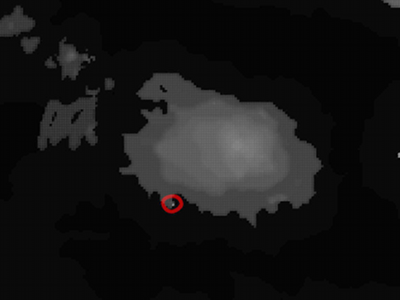 The wilderness between locations is based on a rudimentary heightmap, one pixel of which covers 800 in-game metres. Smaller details are randomly generated, whilst actual locations are pre-generated, and are consequently always the same. The game world is divided between two Tamrielic provinces, covering most of High Rock, the northern part of Hammerfell, and the islands of the Iliac Bay. Spanning two different provinces, the game is quite geographically diverse, encompassing 9 climate regions and 44 different kingdoms, each with a different landscape, climate and culture; these kingdoms also contain unique vegetation, animals, inhabitants, architecture, temples, knightly orders and major powers. Although Daggerfall possesses heightmap data, the amount of height variance in the game appears to be miniscule (excluding the 2D mountains which can sometimes be seen in the background skybox). 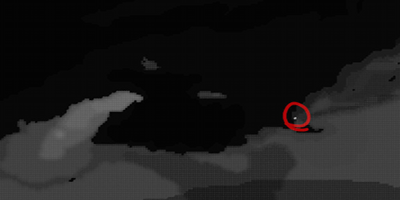 This is due to the noise bump filter added to the ground, combined with the extremely short draw distance. However, it is possible to observe "mountains" at specific points in the game world, recognizable as sudden rises in the terrain elevation. Daggerfall contains a total of 15,251 cities, inns, homes, temples, graveyards and dungeons. Contrary to the randomly generated wilderness separating them, these locations are all pre-determined. 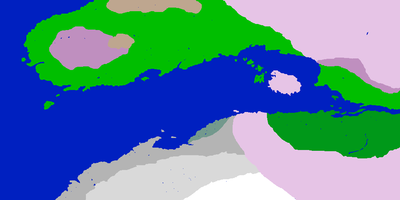 They are spread over the 44 different regions of the Iliac Bay; density varies depending on the size or importance of the region, ranging from the Wrothgarian Mountains, with 1,833 locations, to the tiny island of Cybiades, with only one. It is possible to sort these places of note into four main categories, following the in-game map labels: Dungeons, Homes, Temples and Towns. This article only lists some of the most relevant locations. A complete list of locations is included in each specific region article. There are a total of 4,229 dungeons in Daggerfall, which contain various enemies and block types. Depending on the location, they can include haunts, dens, laboratories, caves or graveyards, among others. These include farms, isolated houses, manors, palaces and urbanized dead ends. There are a total of 4,400. Temples can includes isolated altars, monuments or shrines, friendly covens, or "temple compounds" (Temples with several buildings surrounding it). There are 1,532 separate religious sites. Daggerfall towns include cities, towns, villages and independent inns/pubs complexes. The total amount of Towns in Daggerfall is 5,090. 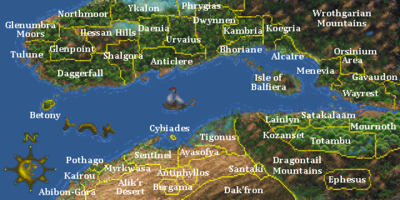 Note: Cybiades island and Dak'fron region in Hammerfell and Betony and Balfiera islands in High Rock, lack a capital. For a calculation of total game world area in Daggerfall, see Dimensions of the Iliac Bay. For a full list of regions as defined in the game data, see Region Numbers. This page was last modified on 25 February 2019, at 00:25.